Stems: Erect, stout, longitudinal ridges, prickly. Leaves: Opposite, simple, sessile, oblong to oblanceolate or lanceolate, to 16 inches long, 1.6 to 4 inches wide, arching, nearly smooth but prickly on mid-rib beneath; margins wavy-toothed, prickly, becoming entire upward; bases often united. Inflorescences: Head, erect, dense, ovoid to nearly cylindric, 1.2 to 4 inches tall, 1.2 to 2 inches wide, terminal on long stalks; involucral bracts linear, elongate, .8 to 6 inches long, 1/12 to 1/5 inch wide, often equaling or surpassing head, upward curving, tapering to spiny tips. Flowers: Calyx small, cup-like, 4-lobed, silky; corolla funnel-shaped, 1/3 to 3/5 inch long, unequally 4-5-lobed, pale purple; stamens 1-4, projecting conspicuously beyond corolla; bract subtending each flower rigid, long-tapering. Fruits: Achene, 1/8 to 1/6 inch long, hairy, crowned by persistent calyx; seed 1, brownish. Habitat: Roadsides, weedy pastures, wet ditches, fields, ravines, waste areas, low moist places. Distribution: Principally the east 1/3 of Kansas. Origin: Native to Europe. Now naturalized. Uses: Native Americans used the heads to card wool and treated acne with a wash made by steeping the leaves. 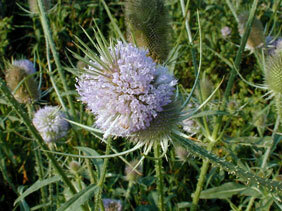 Teasel was sometimes cultivated for the spine-bracted fruiting heads which were used to raise the nap (teasing) of wool cloth. Comments: Teasel is an invasive weed. It is listed as a noxious weed in several states, including Missouri, Iowa, and Colorado. From Greek dipsa "thirst", alluding to the joined leaf bases that catch water. Fullonum refers to "fullers" who tightened wool weaves by rubbing with the heads. See also Cutleaf teasel Dipsacus laciniatus.